5B High St, Caterham on the Hill, CR3 5UE, Tel: 01883 336633. Shop Smart offer: 10% off labour costs from 1 hour or more with Shop Smart. Computer Solutions on the Hill for supply and repair of laptops, desktop, servers and all accessories, on-site or in-shop, for home users and businesses. 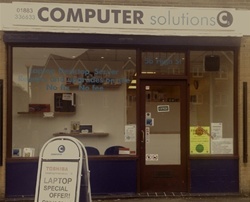 Computer Solutions offer sales and repairs to laptops, desktop, server and supply a wide range of accessories. We can offer repairs in-house from £10, or can come on-site to your home or office. 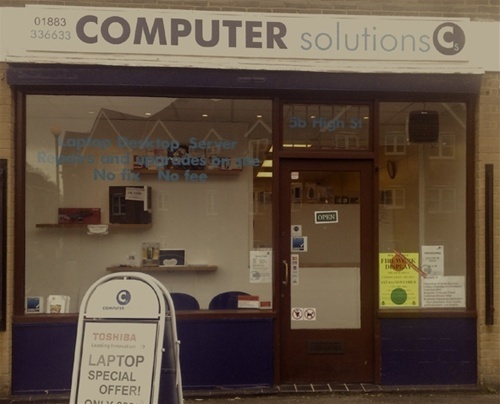 We have been established since 1995 and have recently opened a shop at 5b High Street, Caterham-on-the-Hill. Our friendly team offers professional advice and have no premium rate support numbers! Charges are extremely competitive as labour is only charged by the half hour, not the whole hour. Our fully equipped workshop supports home users and businesses, including Small Business Server and MS Exchange. We also offer colour copying and printing to A3 size for a minimal charge. We offer a very fast turn-around time of usually either the same day or next day at no additional cost. We are also specialists in supporting charities and schools where special pricing is available. Virus removal is one of our most common services. Screen and power socket repairs are carried out in-house. We also supply and install small business telephone systems, and remote worker or mobile worker mobile computer solutions. Parking is available behind the shop (signed) or on our forecourt as well as street parking and the free ‘shoppers car park’ approximately 100 yards away. Opening hours: 9am to 5.30am, Mon-Sat. Computer solutions have taken over the Village Health Foods location.